I was diagnosed with Graves' disease at age 29. No one in my family has ever had any thyroid issues. My diagnosis came a month after my mother lost a 3 year battle with breast cancer. My endocrinologist suggested I most likely developed this due to prolonged, high levels of stress. I had not felt well for months, and had extreme fatigue, and noticed my heart raced even when I had been lying down and resting for a while. I only went to my family doctor because my feet and ankles were very swollen and I had never had that happen before. Since I suffer from PTSD, it's conceivable that excessive stress kick started it, although there's no way to know for sure. Nobody in my family had or has Graves' disease. I do not smoke or eat high salt foods. Seafood is limited in my diet. I had one anxiety attack in the year 2012. I do not live a stressful life. Unfortunately I have been diagnosed with Graves' disease, and it has attacked my body in such a way as: 60lb weight loss, hair loss, I tire extremely easy, rapid heartbeat, shortness of my breath, asthmatic symptoms, and my beautiful face has these pockets under my eyes! I went to the emergency room with chest pain and my blood pressure was way over my average and my heart rate double the normal. The doctors did all the tests they could only to find out I have Graves' disease. Now I am on methimazole for my thyroid and metoprolol for my heart. I am very nervous about taking these medicines but I know I have to, just to save my life from a big heart attack. What were the symptoms associated with your Graves' disease? 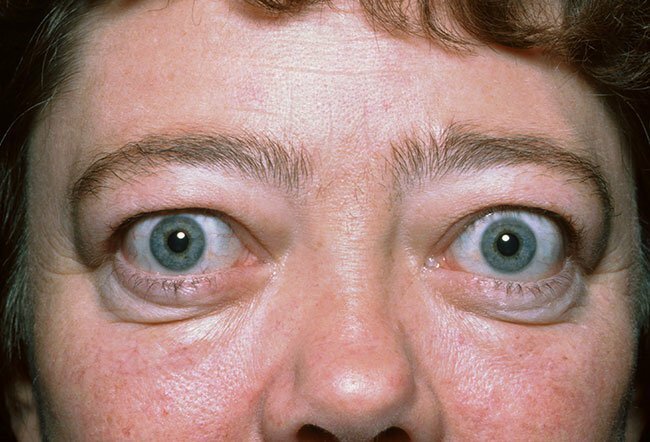 How is your Graves' disease treated? What medications do you take? Please discuss how you managed your Graves' disease during your pregnancy.